Riding through the big mountains of the west can be so cathartic. Their presence envelops me and I become– no, I realize– that I am so small. Felkerino’s and my efforts to clamber over the mountains is almost laughable. We take so long to go up and over their every bump that I suspect we amuse the land with our hours-long pedaling antics. But the mountains don’t seem to mind us. They were here long before we were and they will exist on this earth long after we depart. Today’s route was so picturesque with plentiful 360 degree views. With the exception of feeling like we were in a soup bowl of dry heat at various points, it was a perfect day. 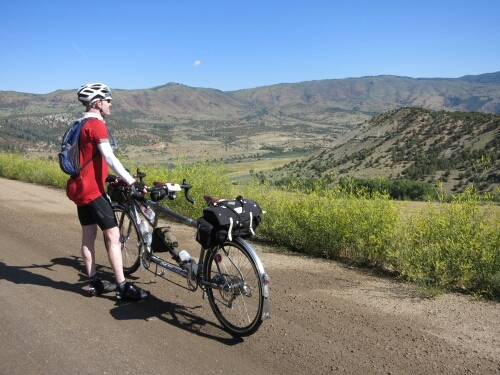 In the early miles of our ride my thoughts wandered to my “non-vacation” life. My mind grew cluttered with what-if talk. What if things were different? Am I living my life the way I should? This is a conversation I often have with myself, as those who know me will attest. The mountains answered in their unexpected mysterious way. I had money in my pocket for a pop and potato chips. I had a beautiful bike to ride. I had a loving partner by my side (or in front of me, if you want to be literal). There was no need to contemplate what-ifs. They did not matter. 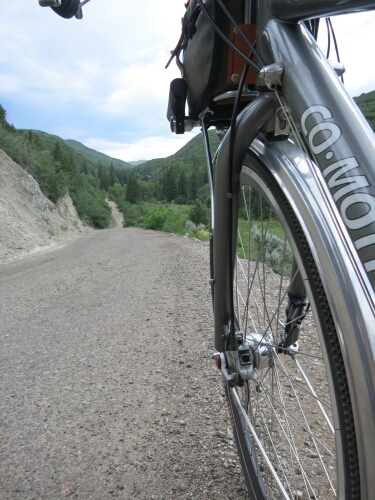 Content with my life and in my smallness, I kept pushing the pedals through the big Colorado mountains. This is beautiful. Love the travelogue! Going through a similar thought process myself, please elaborate on the what-ifs, even if off-blog, if you wouldn’t mind? Can’t remember if I got back to you on this… Sure. I will see about putting something together. I believe the word you are searching for is ‘sublime’. You experienced the sublime..
You went *that* way from Kremmling to Carbondale?! Very adventurous. I think today from C’dale to Paonia has fewer adventure options, and should be a well deserved shorted day in the saddle. Rides like this are why I moved out here. Love my state. Hope the mountains are good to you! They were so good to us. Can’t wait to go back for another adventure. Sublime works. Your ride makes me recall my one ride across Colorado almost 20 years ago. But I love how you are doing it so light. It’s exciting to see how you are thinking about the ride, and life, as you go.